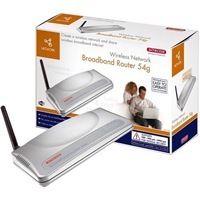 This Wireless Network Broadband Router functions as the central component in any 2.4 GHz wireless network: one or more Wireless Network Adapters (PC Card, PCI or USB) can communicate via the Broadband Router, as well as connecting to a wired network. Thanks to the router function all connected PCs (wired and/or wireless) have full-speed access to the internet via one internet subscription. The 4 built-in Switch ports can be used to connect extra PCs or network equipment. The Broadband Router is backwardly compatible with the existing 802.11b standard.